Moonstone Love Knot — Christina Made It. Here's how I made a bezel set knot ring. Bezel just means the part surrounding the stone that holds it in place, the bezel covers the sides of the stone and just shows the top. This was slightly complex to make due to the multiple joins. With silver and gold soldering you only have 3 options to join the metal; easy solder, medium solder and hard solder. They each melt at a different temperature, hard being the highest temperature. For example you couldn't use 3 easy solder joins as after you have joined the first one and move onto the second join, when you get it to the correct temperature, the first solder will melt and then fall apart. The same thing would happen if you used easy (low melting point) and then medium (requires a hotter temperature) for the next join (the other way round would be right; medium (high heat) then easy(low heat)) so alot of planning has to go into the various joins as 5 joins were needed in total. I've listed the solder types along the way to hopefully help it make sense. A base is made for the holder, for the stone to rest on top of. It's important that everything is shaped to fit tightly no glue is used in silversmithing (sometimes I do cheat and break this rule by using an epoxy resin - bonding type of glue) basically the stone is fully reliant on the silver to hold it in position. This is soldered together using medium solder. The edge is filed to conceal the joins. Then onto the knot. I had a little practice with some wire to see which direction the loop would need to go. 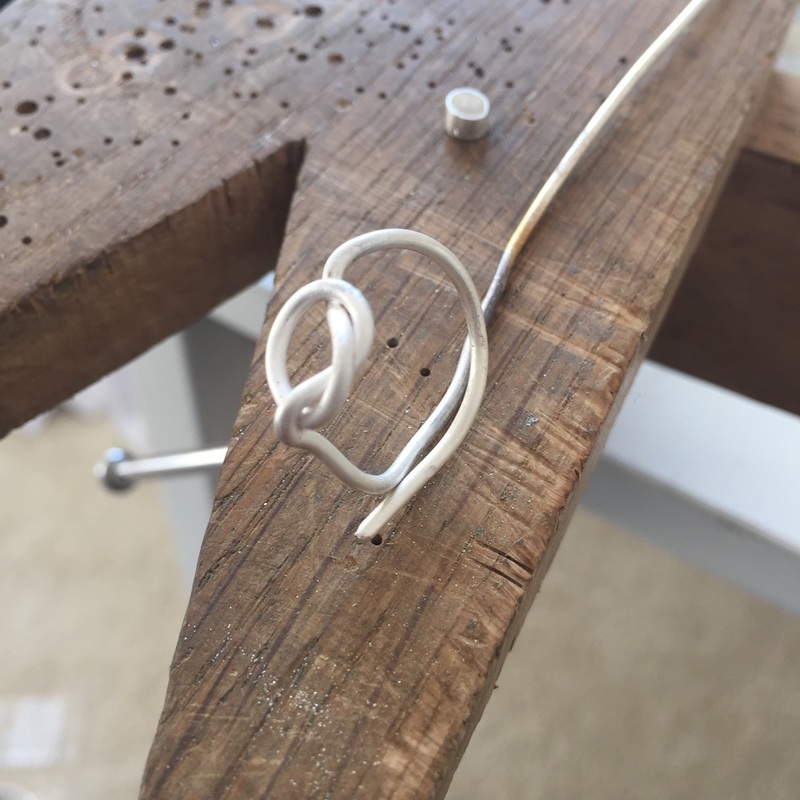 Luckily it worked and a knot was created. The cup that was made for the stone is then joined using easy solder to the inside of the knot. Once I was happy the stone was secure, I polished the ring with tripoli (abrasive wax) and then with rouge (a buffing wax) which gives it that silver shine. And this is the finished result, bezel set rainbow moonstone in the centre of a love knot ring. I make things and then I blog about it. Sometimes I blog about jewellery, sometimes I blog about other things. Go on, be nosy, have a read. *Images are all my own images, unless otherwise stated. Feel free to use them just don't forget to mention me.